My Embroidery World: Lynette's needlelace. Here is a piece of needlelace which I did using a drawing from my archive of designs. Again another peacock! They do lend themselves to a lot of interpretation for needlework & lace work! Enjoy! 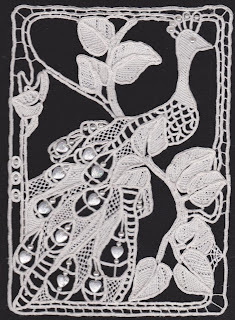 This is lovely lace work. Oh Sallyann, this is absolutely stunning! I love peacocks, and have a collection of about 200 embroidered peacocks in one form or another. If you want to see some, one of my blogs is dedicated to my collection. Hi Gina, Just visited your peacock page. Love it! I will try & post my peacock which I did in stumpwork on Chatterfox for you to view.